Similar to our cap-less Slide Out drive, the Thin Slide Out flash drive is slightly thinner and has a rounded end with a built-in key ring. It is available in white, blue, black and gold with custom colors also available. We offer silkscreen printing up to 4 colors, giving you all the variation you need to print a snappy logo that will draw customers in. All these customizable options make it an excellent promotional USB drive! 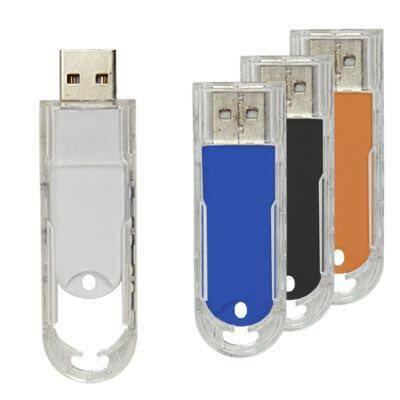 For a softer look than the Slide Out, try the Thin Slide Out promotional flash drive. Customer’s tastes dictate what freebies and company gifts go over well and this one has mass market appeal. It comes in several modern and spiffy drive colors in sturdy, long wearing plastic. It features a sizeable print space for your logo, which will be silkscreen printed right on the casing. The sliding design of the port makes it easy to travel with because it will not snag and the key loop offers easy transport. This high perceived value option is sure to stick around and be utilized frequently, thus expanding your brand name recognition.